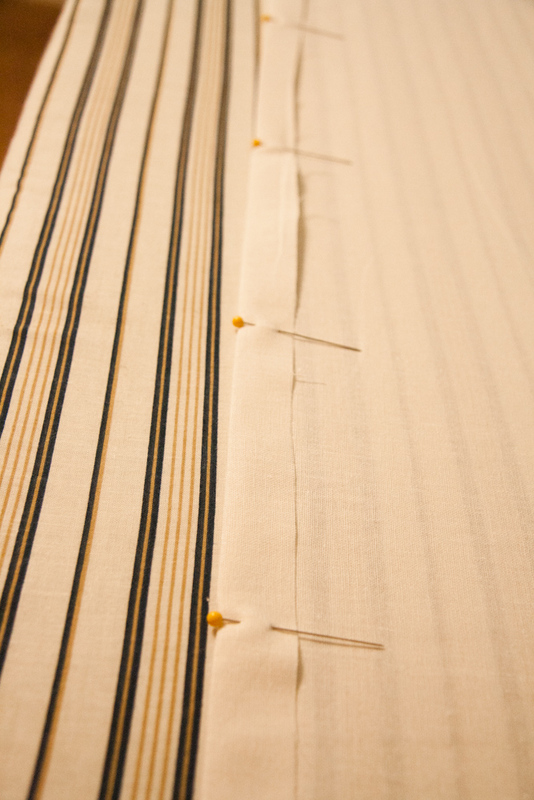 For my 2nd sewing machine project, I decided to make curtains to match the pillows I made a few days ago. Don’t worry, I didn’t use the same patterned fabric. That would have been WAY to much pattern. 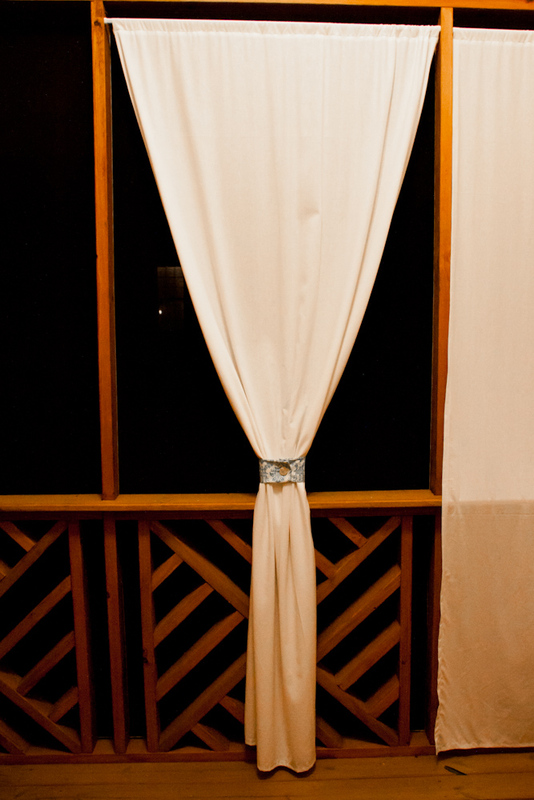 Instead, I used white linen fabric for the curtains, and then to make everything coordinate together, I used the fabric from the pillows to make cute buttoned ties to go around the middle of the curtains. Thank goodness for Coupon Commotion at Joann Fabrics. Otherwise this little project would have turned into a very expensive project! 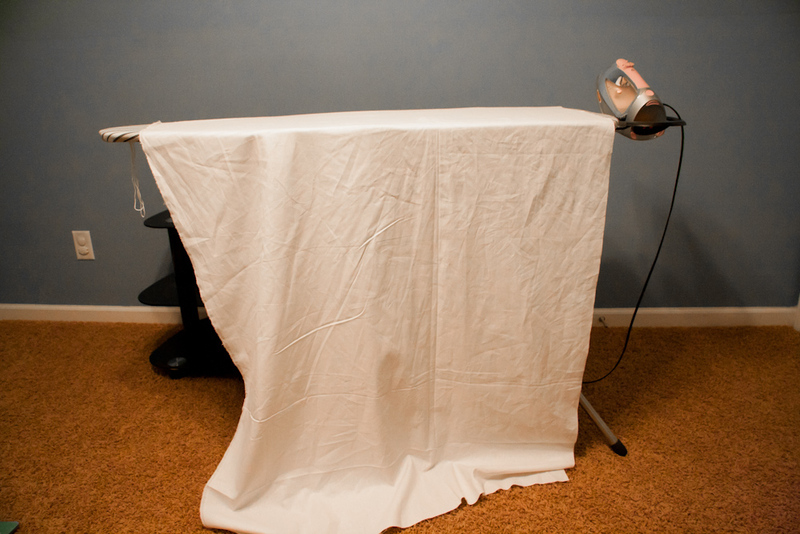 If you’d like to make some curtains of your own, here’s my interpretation of how to do it. Granted, I just kinda made it up as I went along and did what I thought seemed right, so if there are any experienced sewers out there feel free to tell me how I could have done this better. 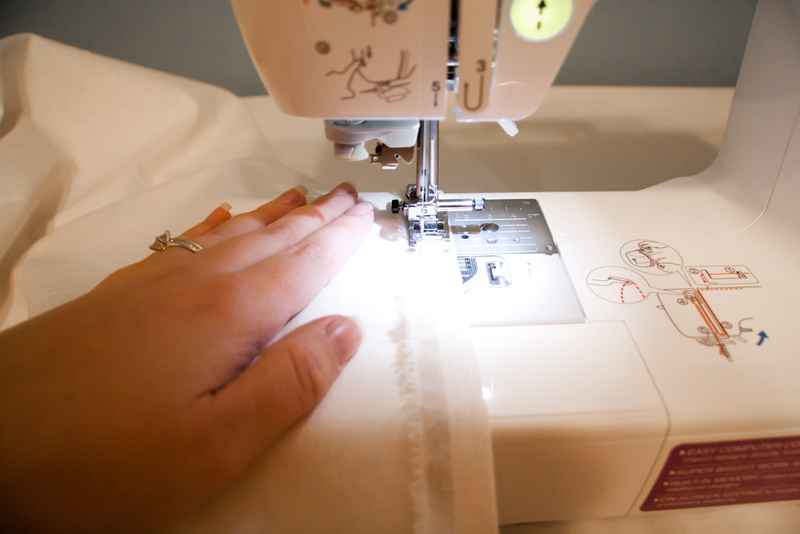 I’m still working on sewing in a straight line with the machine! 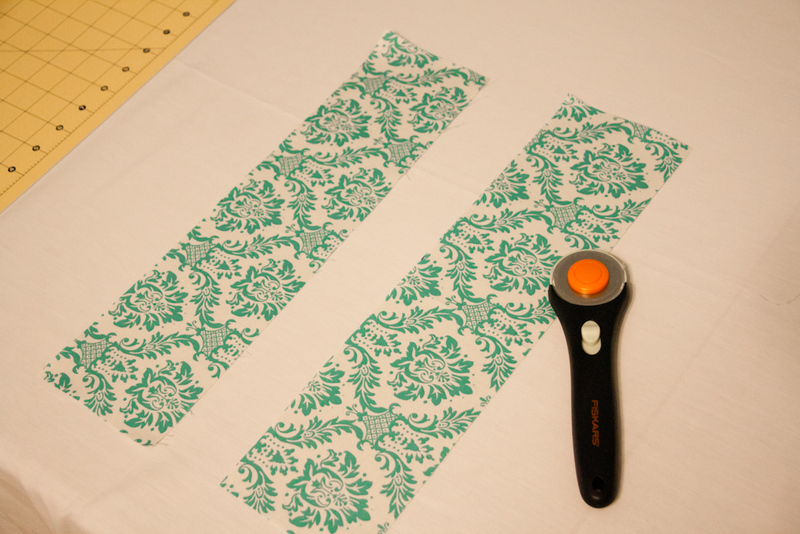 I started by cutting my fabric to the length and width I needed. When I told the lady at Joann’s that I needed 8 yards of fabric she gave me a very surprised look, until I explained that I was making curtains. 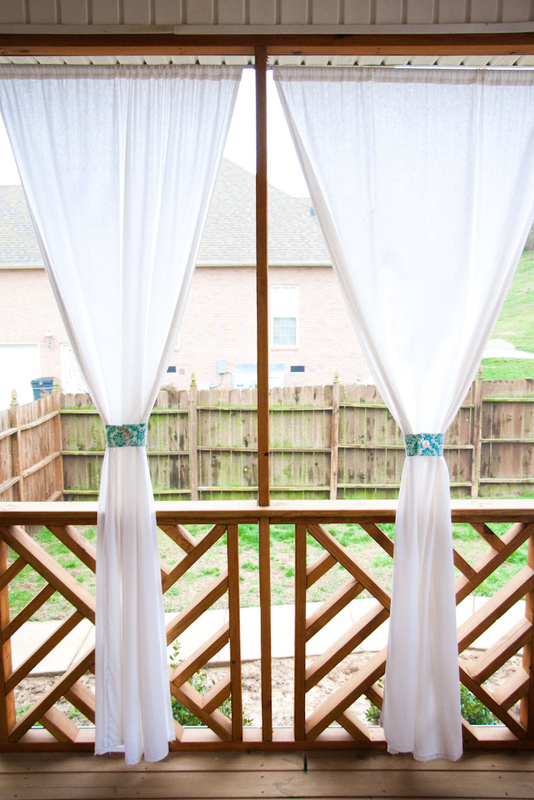 Then a couple days later I decided that I wanted to cover every opening on the patio with curtains instead of every other, so I had to go back and get 8 more yards! That is where my 40% off coupons came in very handy. 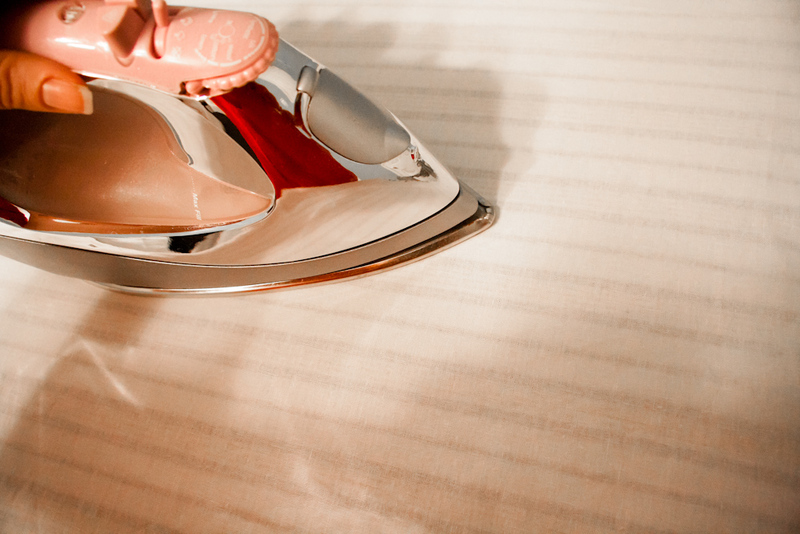 I then ironed the fabric so it was nice and smooth. 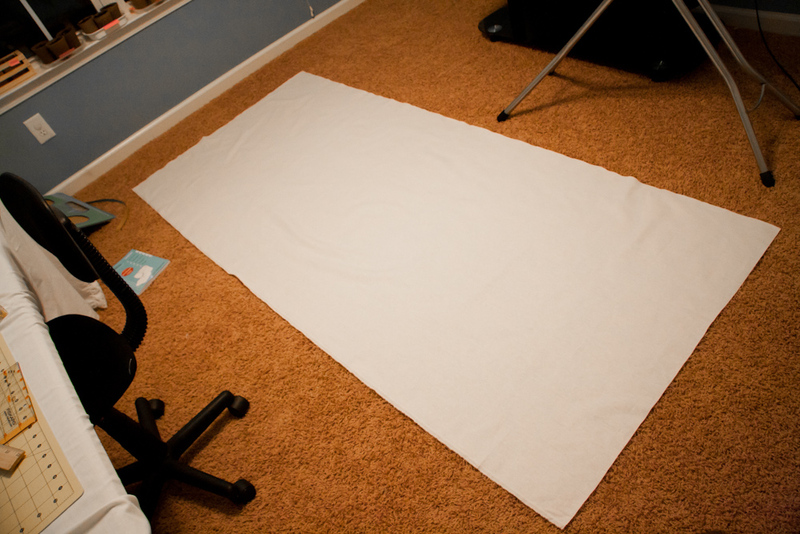 I barely had enough room to stretch my fabric out on the floor, but I managed. 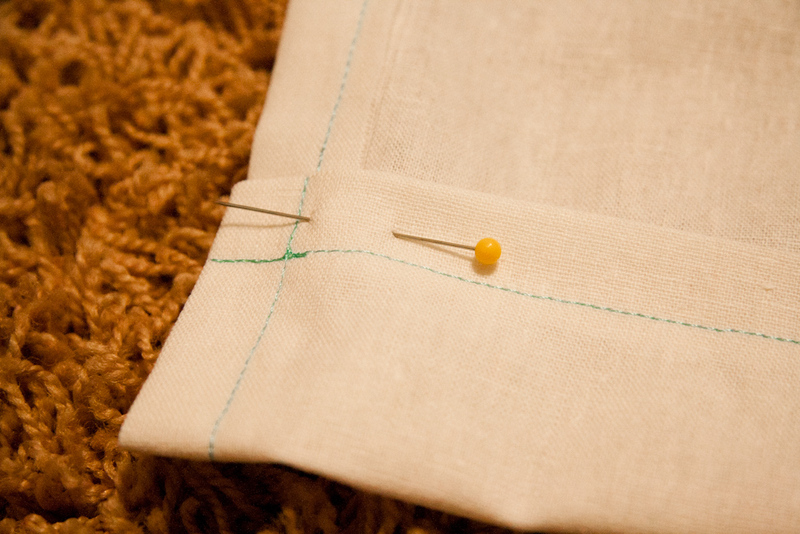 Next, I folded the fabric 3/4 inch all the way around and pinned it. This is probably too thick of a seam, but I didn’t want to go too thin since I’m still practicing sewing in a straight line. 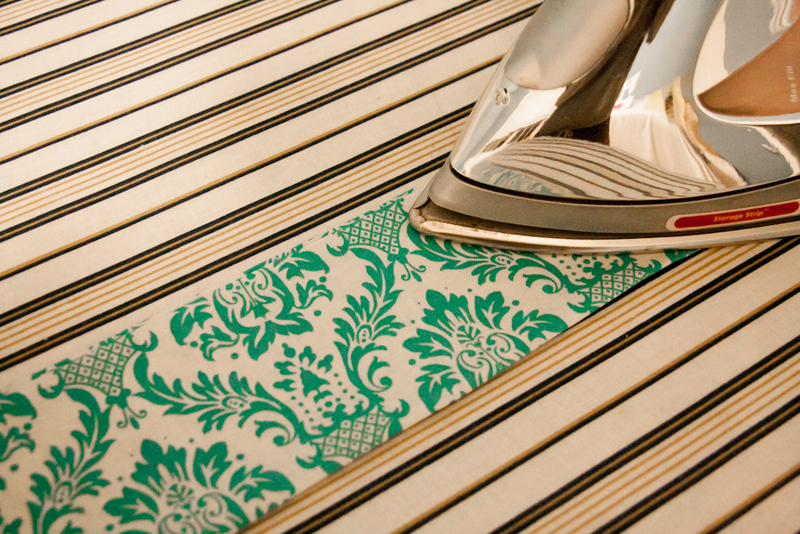 I then pressed the fold so that it made a nice sharp seam. 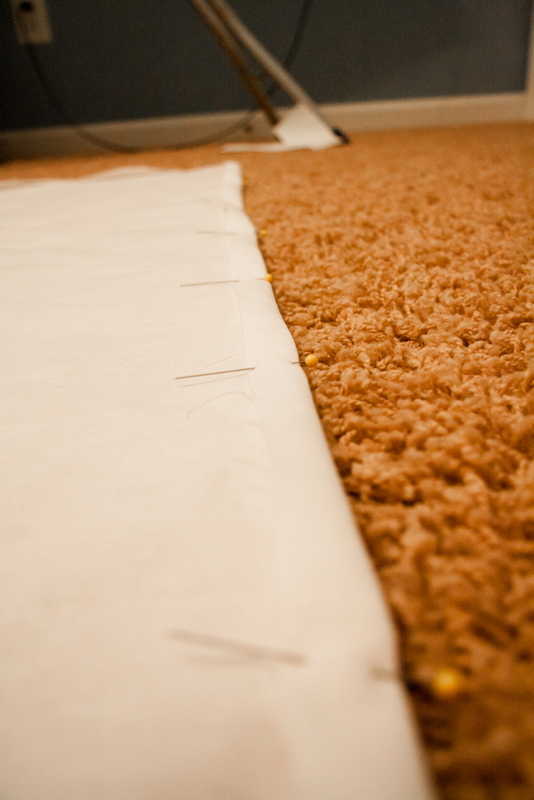 I will neither confirm or deny that I stepped on a pin sticking straight up during this process. You can’t make me admit to it! This pain in my heel must be from something else. 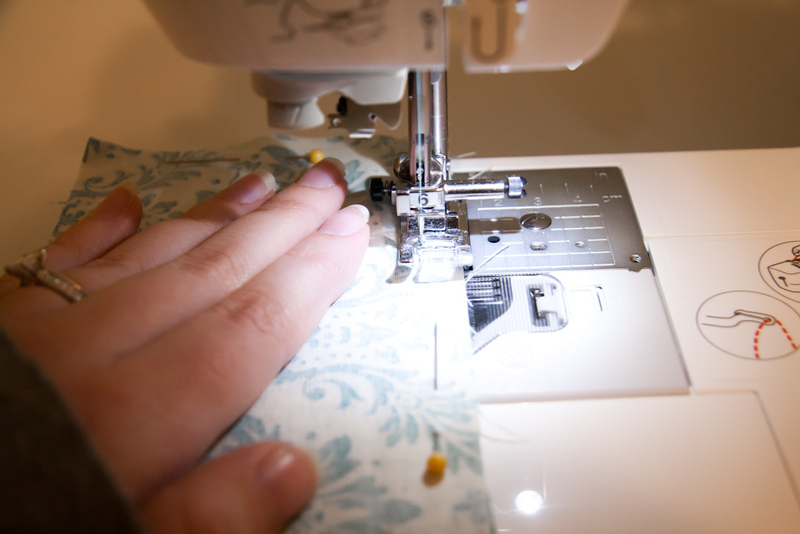 Now I was ready to sew the seam! That light on the sewing machine is so helpful! 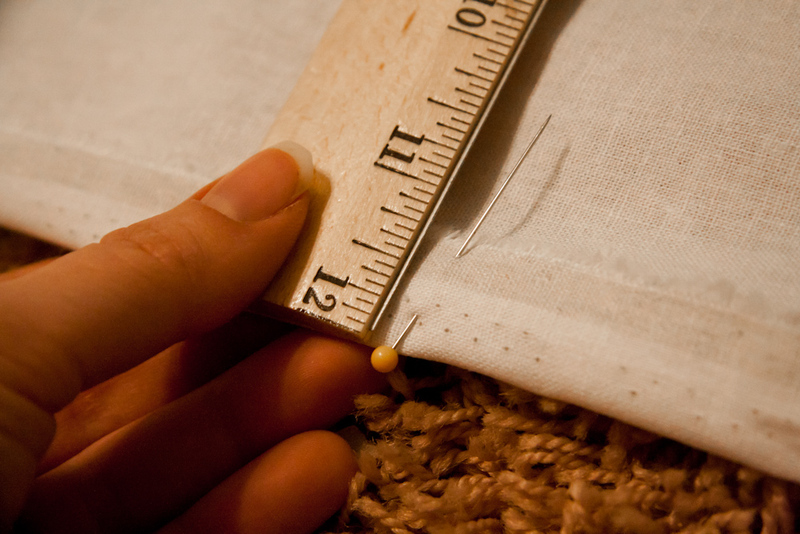 When I finished sewing the seam around the entire curtain, I then folded and pinned a 2 inch section across the top of the fabric. This is where the curtain rod will go. Then I was ready to make the patterned button ties. 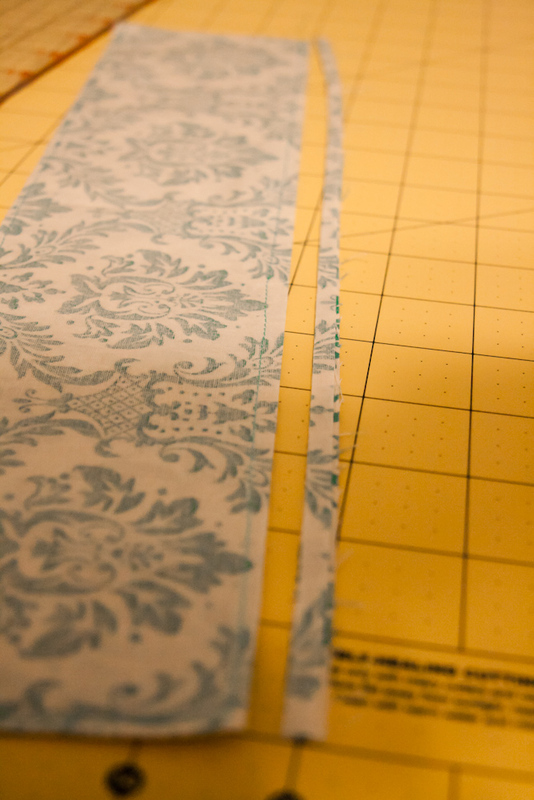 I started by cutting 2 identical 4×15 inch pieces of fabric. 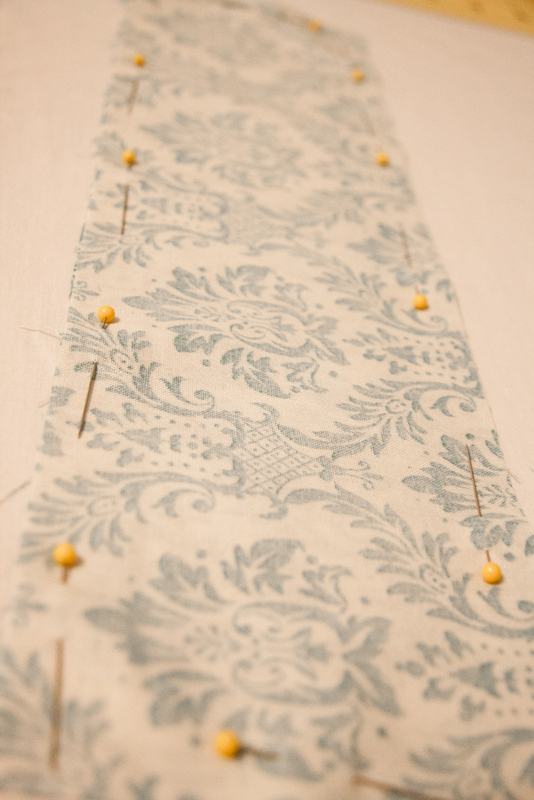 Then I laid the fabric so that the right sides were facing each other, and pinned. 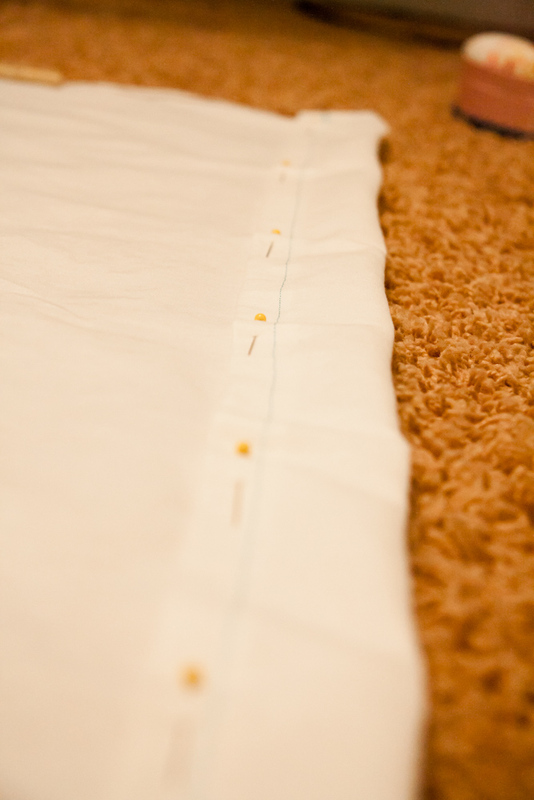 I sewed 3 sides together, leaving one short side open. I trimmed the excess fabric from the edges so it wouldn’t be too bulky or fold in a weird way once I turned the fabric right side out. After the fabric was facing the right way, I pressed it. This was a little tricky since the seams didn’t want to expand fully. 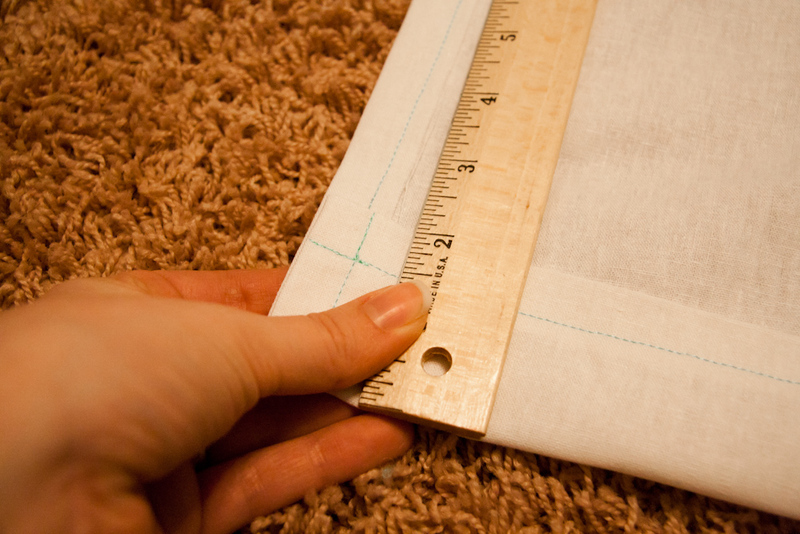 I ended up inserting my ruler into the little sleeve that was created when I left the one end open and was able to force the fabric out so that the seam was nice and tight. 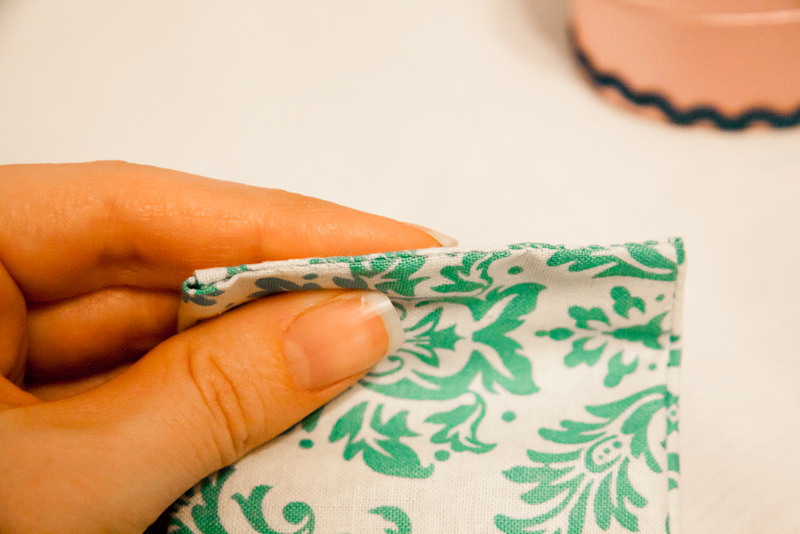 Then I folded the open end in about 1/4 inch and slip stitched it closed. You’re supposed to barely be able to see the slip stitch if it’s done right. I need a little more practice, but I think I did okay. 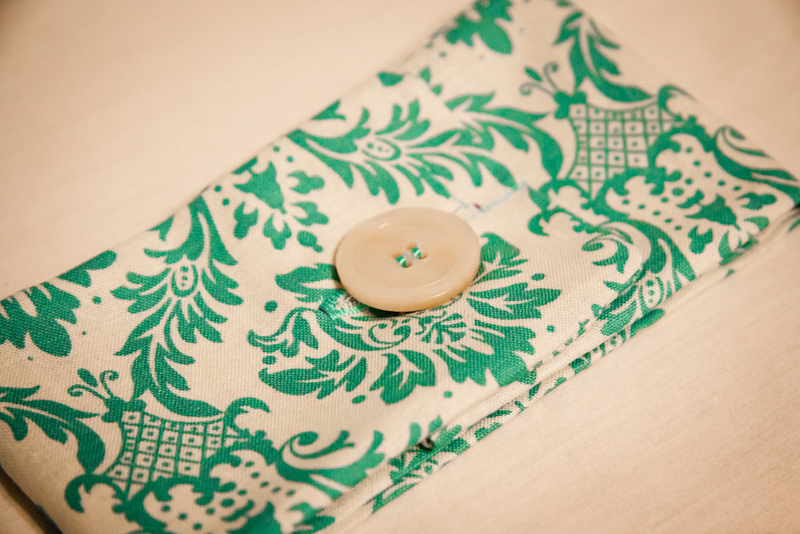 I actually figured out how to sew a button hole and button onto the fabric using the sewing machine! Granted, I studied the directions for several minutes before I started, and then I still ended up messing up……twice. 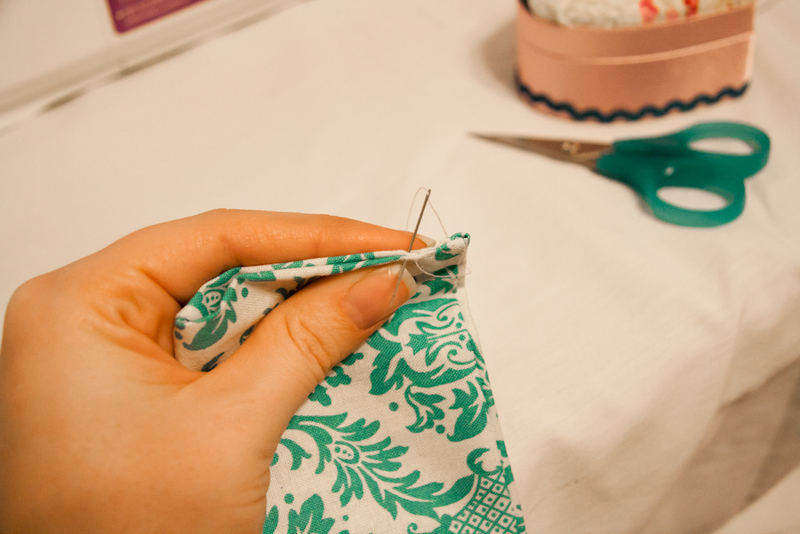 But at least I’ll know what NOT to do when I make the next 5 curtain ties. And here is the finished product!!!! 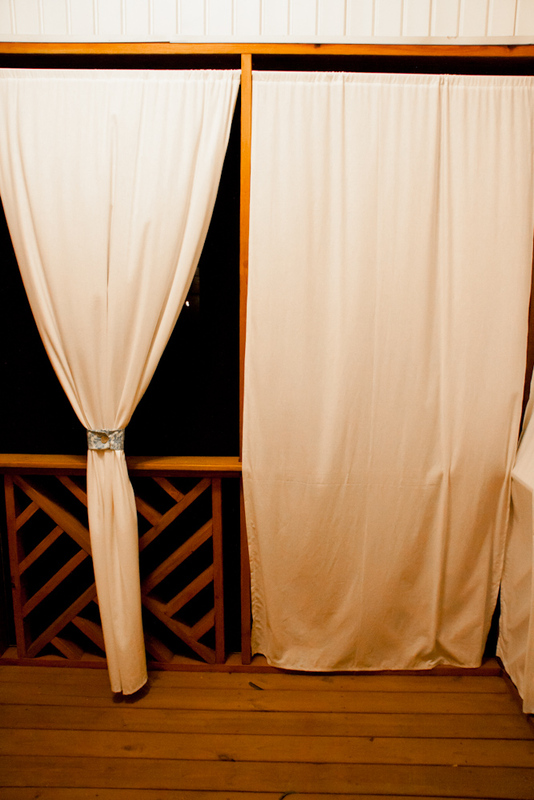 There are 6 openings where the curtains will be. I know I probably should have taken this picture when it was light outside, but I finished sewing the curtain tie around 12:00am and I couldn’t wait! Hopefully once we have the loveseat and chairs accessorized with the pillows I made out there it will all tie together and look nice. At first I was just going to have the curtains left loose at every other opening, but it just looked too plain. So that’s when I decided to add the ties. I think it looks alot better. What do you think? Any suggestions? Here’s an updated picture from this morning. Looks so much prettier during the day. 🙂 Gotta love that natural light. Looking great love! 🙂 Can’t wait to come home and see them! Thank you baby! Can’t wait for you to see them! Sooo cute! I really like the tie-backs and button accessories. You did a GREAT JOB!!! (teacher talk!) Ha! Love you, sweetheart! Happy birthday!!!! They look great! I have a bedroom that needs to be done. These are a great idea and I love the tie-backs also. I think the blue furniture will match well and add a perfect amount of color to blend with the curtains!